1. Preheat the oven to 200°C, gas mark 6 and line a large baking tray with baking parchment. Pour the sugar onto the tray and spread out into an even layer. Place in the oven for 5-6 minutes, or until it feels hot to the touch and the very edges of the sugar layer are just starting to melt. 2. Meanwhile, put the egg whites into a large bowl. Whisk them until they resemble stiff peaks. When the meringue is ready you should be able to tip the bowl upside down without anything falling out. 3. Carefully whisk the hot sugar into the egg whites, adding a spoonful at a time and letting each spoonful fully mix in before adding the next. If you add the sugar too quickly, the meringue may collapse. Avoid adding any of the melted sugar around the edges – this will not dissolve properly in the meringue. 4. When all the sugar has been added whisk vigorously for 8-10 minutes or until the mixture is really thick and glossy. If you rub a small amount between your fingers, you shouldn’t be able to feel any grains of sugar. If it is still gritty, continue to whisk until it feels smooth. 5. Turn the oven down to 100°C, gas mark ¼. Spoon the meringue onto a lined baking tray to form a voluminous circular mound. Bake in the centre of the oven for 1½ to 2 hours, then turn the oven off and allow the pavlova to totally cool in the oven. 6. To make the topping, whip 300ml double cream until it forms soft peaks and fold in 100ml Greek yogurt. 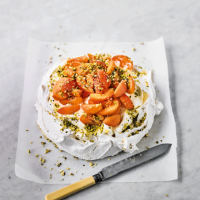 Spread onto the cooled pavlova and top with 320g pack ripe apricots, stoned and quartered. Drizzle over 2 tbsp honey and top with 50g chopped pistachios before serving.